In 2018 water bottles are no longer just a means of transporting liquids, they're a statement of your eco-friendly credentials, and, some are really quite attractive. The Clima Bottle from Italian design brand 24Bottles is a perfect example of this. The revolutionary bottle, launched on September 2017, is a double-walled, stainless steel bottle that keeps beverages hot or cold for 12 and 24 hours, respectively. The design replaced 24Bottles' former Thermo Bottle, to have its silhouette more similar to their already iconic Urban Bottle. This time not only does form follow function, but it also follows the environment. You see, as well as helping people reduce their carbon footprint, Clima Bottle is 100% carbon neutral. The overall CO2 emissions coming from 24Bottles' production, packaging and transport is offset through international reforestation projects that will help the planet breathe better. 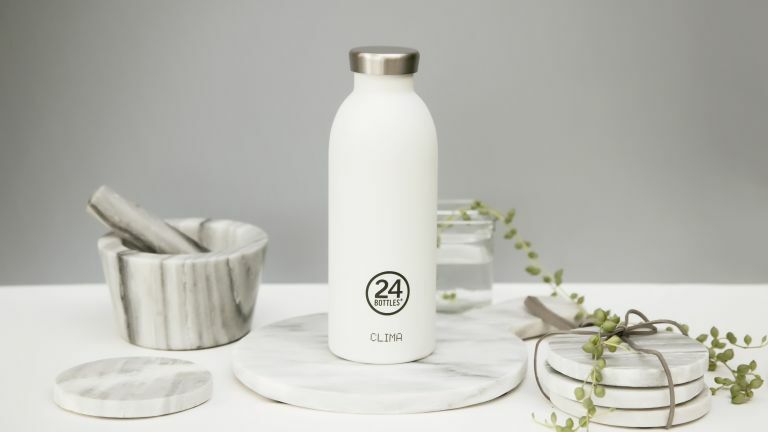 The Clima Bottle has a 500ml capacity and it weights 266g (when empty). As you can see from the gallery above, the bottle comes in a wide range of colours (our favourite it the Ice White option). The Clima Bottle is priced at £29 and is available from End Clothing and 24Bottles.